Next week over 10,000 predominantly Jewish American supporters of Israel will gather in Washington at AIPAC’s annual policy conference. Given their high commitment to Israel, probably most of those gathered belong to the 47% of American Jews who opposed Palestinian statehood. 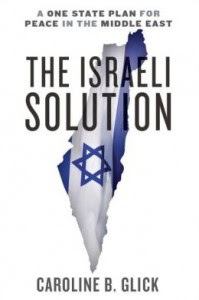 The same day AIPAC’s delegates meet with members of both houses of Congress, my new book, The Israeli Solution: A One-State Plan for Peace in the Middle East will be released by Crown Forum, a division of Random House. The Clinton administration, the US Jewish leadership and the Israeli Left rushed to embrace the findings, even though they were totally inconsistent with annual Palestinian population surveys the Israeli military government conducted from 1967 through 1996. In The Israeli Solution, I fill in the blanks that plague the American discourse on Israel and the Palestinians. I provide a 360-degree analysis of a policy that I call The Israeli One-State Plan. That plan involves applying Israeli law – and through it Israeli sovereignty – throughout all of Judea and Samaria. I divide the discussion into three parts. Part One provides the 90-year history of failure that has attended the two-state model, from the end of World War I through the present day. I also show how the US’s embrace of the two-state model has worked to blind US policymakers from both parties to the realities of the region and so guaranteed the failure of US Middle East policies. Part Two presents the case for Israeli sovereignty from the perspectives of demography, international law, history and civil liberties. Far from transforming the areas into a race-based state, as Israel’s opponents threaten, such a move by Israel will free the Palestinians from life under the PLO’s terror supporting kleptocracy and provide them with full civil and legal rights as permanent residents of Israel. They will also have the right to apply for Israeli citizenship. Even if all the Arabs of Judea and Samaria were to become Israeli citizens, Israel would retain a strong two-thirds Jewish majority. And it would avert the only real demographic threat. That is the threat posed by a Palestinian state in Judea and Samaria which would permit millions of hostile, foreign-born Arabs from Lebanon, Jordan and Syria to immigrate to its territory. In Part Three, I discuss the probable responses of the Palestinians, the larger Arab world and the EU to a decision by Israel to apply its laws to Judea and Samaria and abandon the two-state policy model. I also discuss how such a move will impact Israel and the United States. Most delegates at AIPAC do not realize that Israelis have moved on from the failed two-state formula. It is my hope that in the year between this AIPAC conference and next year’s conference, they will read my book, and understand that they needn’t support the establishment of a Palestinian terror state. There is a better option. It is better for Israel. It is better for the Palestinians. And it is better for America. If they do read my book, I hope it will open a long-belated discussion about Israel’s true options. If they do, I can assure them that next year’s AIPAC conference will be more realistic, and more optimistic than next week’s conclave.